We bring forth Copper Single Multicore Flexible Cables, to the clients all over the world. 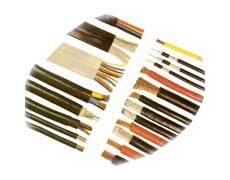 The Copper Single Multicore Flexible Cables provided by us bear the mark of IS: 694: 1990. Our Copper Single Multicore Flexible Cables are made from 99.97% pure, electrolytic grade, bright-annealed bare Copper, for excellent conductivity and longer functional life. These Copper Single Multicore Flexible Cables are ideal for conduit wiring, in various sectors. Area Sp. Mm Conductor Construction No./Dia In m.m. Cond.Dia mm Max. DC Resistance Ohm/Km At 20 0 C Insulation Thickness (Nominal) m.m. Cable Dia m.m Current Rating Amp. Area Sp. m.m. Con. Dia m.m. Max. DC Resistance Ohm/Km At 20 0 C Insulation Thickness (Nominal) m.m. Cable Dia. m.m. Cable Dia m.m. Approx. Current Rating Amp. Nominal Cross Sectional Area of Conductor in Mm 2 Nominal Insulation Thickness in M.m. Max. Over all Diameter of Cable in M.m. Conductor Area Sq. m.m Strands/Dia In m.m. Cond. Dia m.m. Max. DC Resistance Ohm/Km At 20 0 C Insulation Thickness (Nominal) m.m. Core Dia m.m. Sheath Thickness In m.m. (Nominal) 2 Core 3 Core 4 Core Overall Diameter In m.m. (Approx.) 2 Core 3 Core 4 Core Approx. Current Rating Amp. No. OF WIRE WIRE DIA. m.m. BUNCH DIA. m.m Max. CR at 20 0 C Ohm/km Nominal Insulation THICKNESS m.m. Approx CORE DIA.m.m. 6 CORE 7 CORE 8 CORE 10 CORE 12 CORE APPROX CURRENT RATING AMP. No. OF WIRE WIRE DIA. m.m. BUNCH DIA. m.m Max. CR at 20 0 C Ohm/km Nominal Insulation THICKNESS m.m. Approx CORE DIA.m.m. 14 CORE 16 CORE 19 CORE 37 CORE APPROX CURRENT RATING AMP.